dab is crap,fm better,mw even better.all the fm stations I find in my opinion are of the same programme type,format,you can go from one end of country to other,tuning in to all the local stations,and they all sound the same. FM is getting overcrowded,DAB- there is still plenty of scope,well up here anyway! Classic FM on FM is the only decent station on that frequency band,the rest is pure Halley's comet! Possibly one reason they're placing the majority of junk stations on FM is to push the DAB format and DAB radio sales up etc. The comment about the DJ's in an earlier post is probably more spot on than I'd thought! Yes,Smooth radio is a decent station as is Absolute 80's.There is still plenty of work to be done until we get the format we hoped DAB to be and a wider station listing.If I were to get a station that could combine Smooth radio and Absolute 80's with a bit of Planet Rock then it would be like going back to how radio was back in my youth and it would gain me as a listener. Anyway Im waffling yes you are all right, FM should stay, get absolute 80s on fm and I would be well happy lol, the only good thing about DAB for me is stations that just play what I want to listen too, Absolute 80's and Rock. 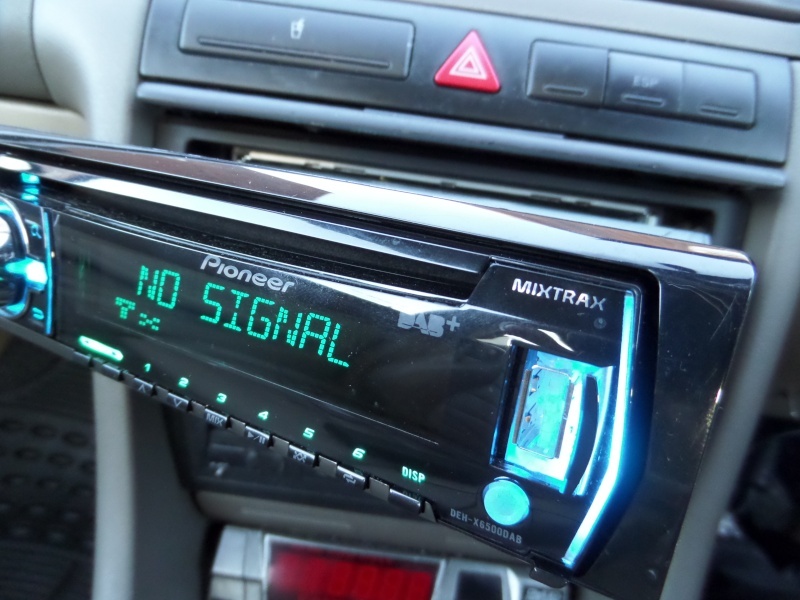 When you lose the signal you lose the lot unlike FM which fades DAB makes this horrible noise and disappears, Im hoping that stops when they bump up the power but I think this has been a white elephant and Im not impressed with the sound quality at all, we were promised cd quality. 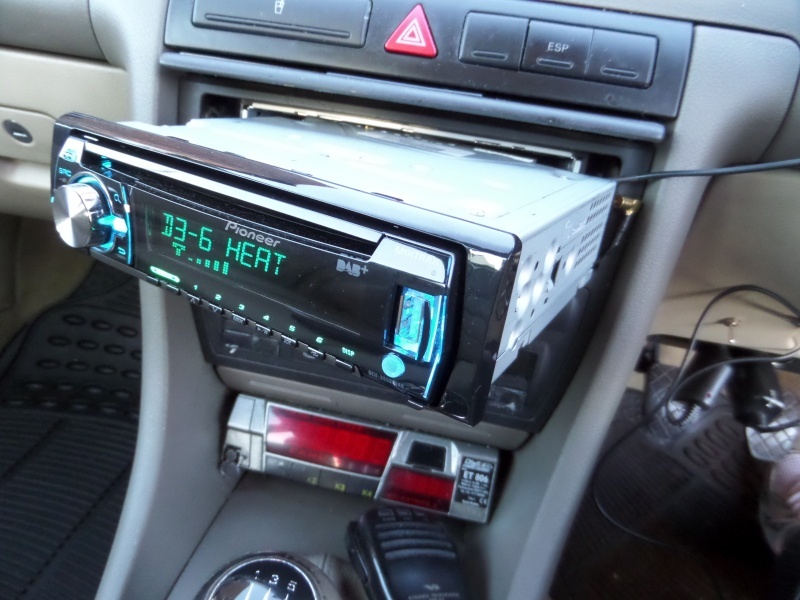 Not had bother with my windscreen antenna on my Kenwood DAB/CD/USB in car radio.Sadly you're right Daryn,when you're out of sight/range or in a zone which obstructs DAB signals,you've got silence and then signal distortion or pixelating if you're out of reach of the nearest multiplex.I drove frequently up to the Leuchars airshow and had this trouble around Cupar etc! I even get a spot of cut-out when I go through the Cowgate and under a wide flyover on the M90 approaching the Forth road bridge! Its bad, I hate it, when it goes it goes I feel that the government has pumped that much money into this that they cannot get out of it. Massive mistake, dont get me wrong if the signal was stronger and the sound quality was better we wouldn't have to complain. We really shouldn't be at all surprised by something like this.It's typically British to do something good but badly! We're a country and people (sorry to be blunt) that are always ill prepared for anything,and not far seeing! And most things get done in a lethargic,grudging,apathetic way these days! 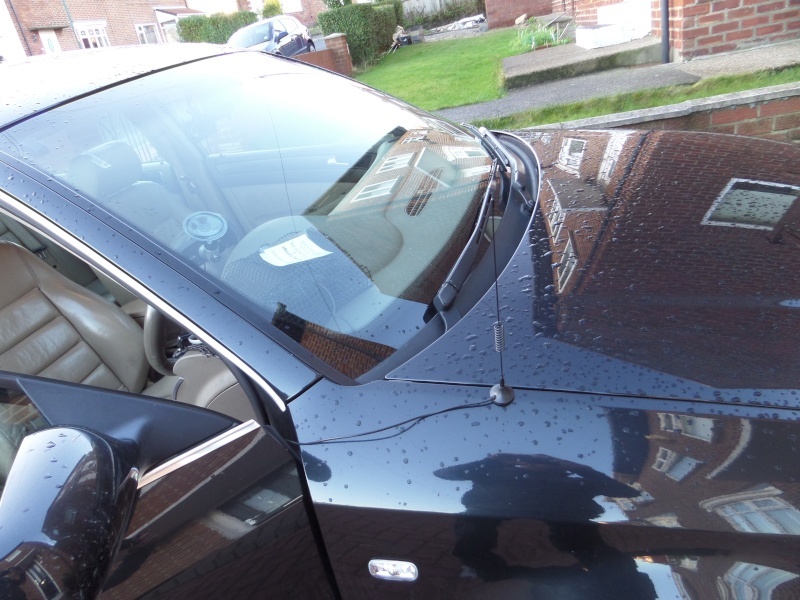 Wasnt sure on the rules of giving a direct link to my own forum so thought I would just copy and paste it here, this is a review I done on commercially bought DAB antennas for cars, hope it helps someone one day. 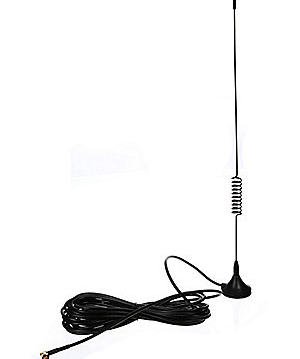 Done lots of searching on the internet for DAB antenna designs for cars and whats being sold in stores and on line. Im a licenced radio amateur and done lots of studying and field work on how antennas work, dont get me wrong Im no expert but alot better than these store fraud assistants. 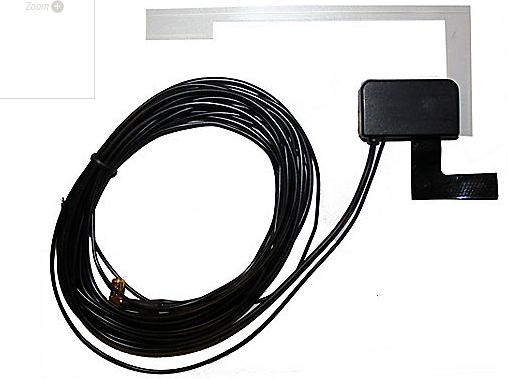 Anyway lots of people advising on what to buy and why, a bit like amateur radio lots of amazing claims of high gains from antennas, I would say 99.9% of them lies, no video or photo evidence so I thought I would do just that to help those looking to purchase these DAB antennas. The story so far and from the beginning. I bought a pioneer DEH-6500DAB radio from Halfords, next I needed an antenna now this is where I didnt use my instincts or my brains, Ive studied antenna design for many years, the guy in Halfords told me they have had no problems with the Autoleads DAB Film Antenna SMB - DAB-AA1 a windscreen type antenna@ £19.99 and that its the only antenna they fit although they do sell others. 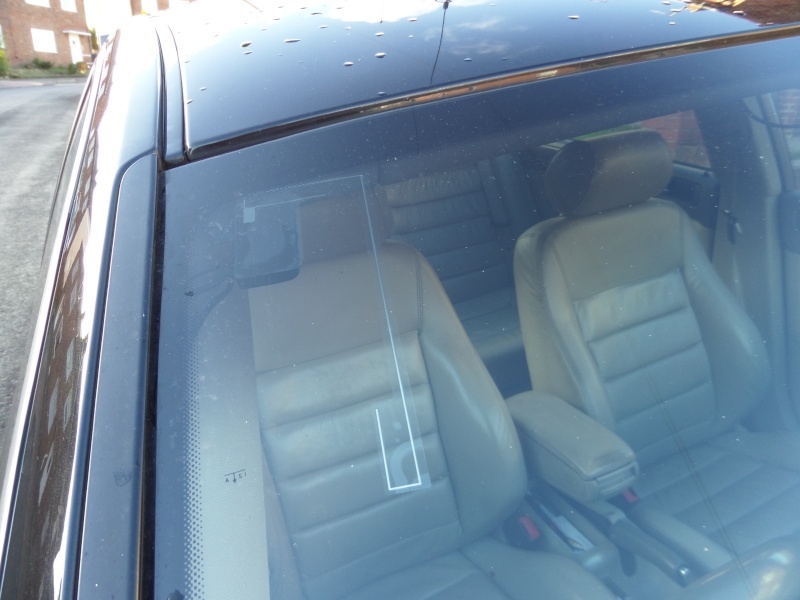 I told the guy that surely a body mounted antenna or magnetic antenna at the correct length would be a better option, his reply was because of the signal strengths that he would still go with the windscreen antenna as its more pleasing on the eye and that I wont experience any problems at all, my mistake was I listened to him. Anyway got back home and fitted the stereo and the antenna hiding all the cables, fitting the 12 volt supply to the antenna and fired it up and yes we have DAB maybe the guy was right after all, driving around I soon found that he was wrong, the signal kept dropping out I was furious after all the work pulling the pillar panel off and getting everything neat and tidy. I went back and told the guy how I felt about it all and asked for a replacement, a magnetic antenna, Sonichi Magnetic Roof Mount DAB Antenna @ £14.99 as this had to be better and is what I wanted in the first place although still sceptical looking at the coax and how light and bendy this antenna could be in the wind. I drove home thinking why didnt I just get my money back and make my own. Anyway once home I got the camera and started taking some photos as I tested this magnetic antenna against the stick on screen power assisted rubbish. You can see here I wanted the antenna to be mounted in such a way that it wouldnt have an advantage over the on screen antenna, Ive stuck it on the wing low down, lower than the on screen antenna, and my car was parked on the drive facing the wall of our house, trying to block the signal here as much as possible. Here is a view from inside the car, this shows Im not giving it much of a chance to work. But here is the signal, a full signal. 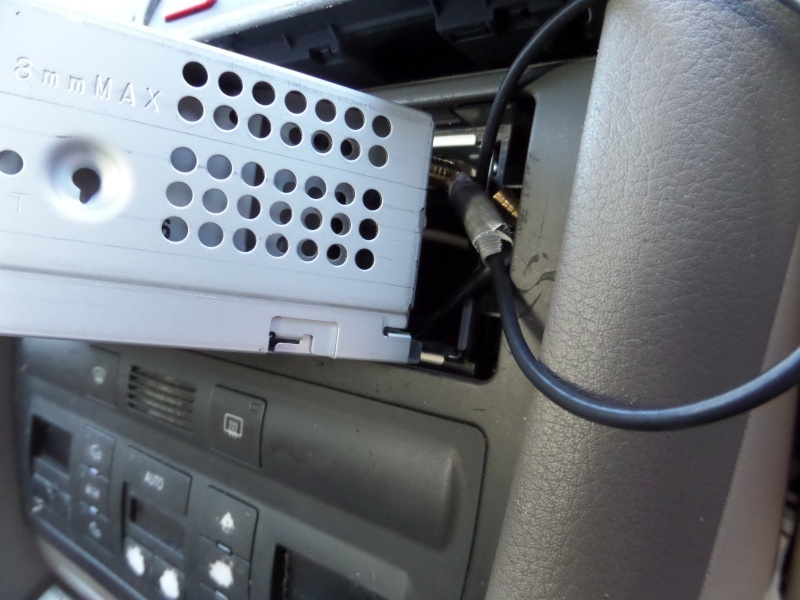 I didnt want the cable going through the door so thought I would feed it through the boot and into the car, I also wanted the antenna on the roof, any radio amateur will tell you if you want an omni directional antenna, that means an even signal no matter which way you are facing then stick the antenna in the centre of the roof as high up as you can, if you stick the antenna at one end of the roof or one end of the car then it will become a directional antenna. The centre of the roof is always the best but unfortunately the cable was not long enough so I thought I would give it a go on the boot lid, now again the centre is better but I wanted my antenna to work harder lol, so I stuck it on the end as close to the back window as possible, again I had full signal and the antenna looked more tidy. 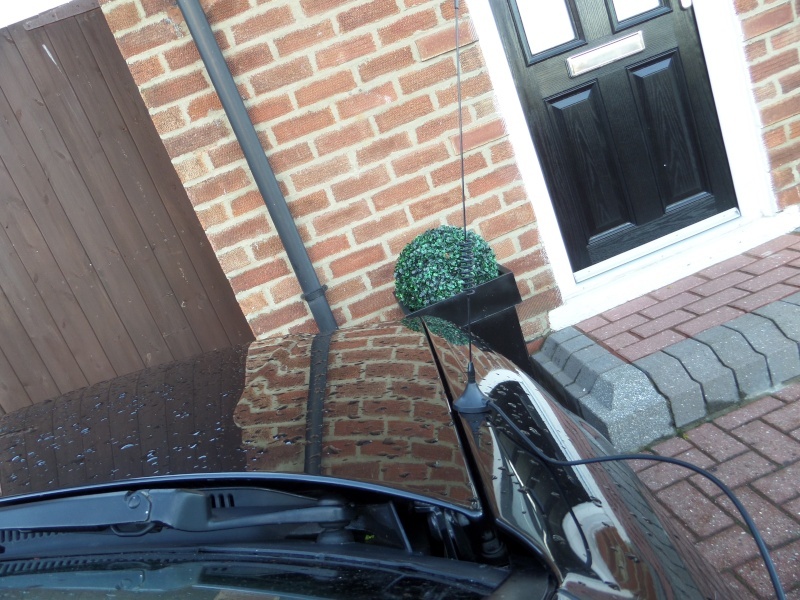 Well I think a body mounted antenna cut at the correct length but this means drilling your car, you also need as good an earth as possible so after drilling sand down the paint on the inside of your car not the outside lol so lets say its on your boot lid, drill through sand the inside. Or go for a magnetic mounted antenna, the larger the magnet the better chance of a good earth although this tiny magnetic antenna is working fine for me. 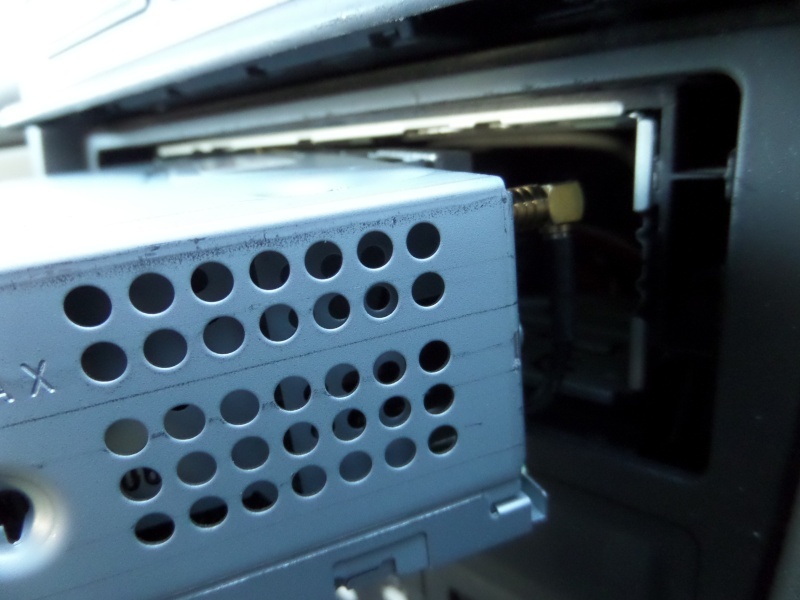 DO NOT USE THE WINDSCREEN TYPE ANTENNA,IT WONT WORK VERY WELL. YES I SUPPOSE IF THE SIGNAL STRENGTH IS AMAZINGLY STRONG IN YOUR AREA THEN IT WILL WORK BUT SO WOULD A PIECE OF WIRE TBH. I am going to make my own antenna, a good strong antenna that wont bend in the wind so even less chance of drop outs, it will have a larger magmount so will withstand high speed driving without the worry of it blowing off and will be checked on my antenna analyzer to see what sort of SWR reading I get, it wont have any curly base or anything like that to make it look fancy, it will be a straight whip measured and cut to the correct length. Come back and check out my next tests to see if I get any drop outs at speed, and to see if the antenna stays on lol. Well just back from the road test, Im really surprised at the difference in signal strength using this small magmount antenna. The results, no matter where I went, no matter what speed I done the antenna had full signal strength, it never flickered. Not sure how it would be on the roof at speed (would it stay on) but I done 80mph and mine never moved from the boot lid although it does have the protection from the back window. But again the signal was full strength. I drove to places that are black spots, I sat on the taxi ranks that have given my signal to drop off with the other antenna but again full signal, it never dropped one bar no matter where I went or what speed I did its really surprised me but Im well happy. A friend of mine has been having the same problems as me, cant wait to show him this review. So their you have it folks, an honest review with photos to back it up, I will video the radio in action at speed sometime and put it on youtube. So save your money, dont listen to the fraudsters in the stores that havent a clue what they are talking about buy the cheaper magmount antenna or one similar or buy a body mounted antenna that has to be connected to the body work via drilling a hole, also if you can get it on the roof especially in the middle you will have a better chance of retaining a good signal in any direction. I hope this helps someone looking into buying an antenna. 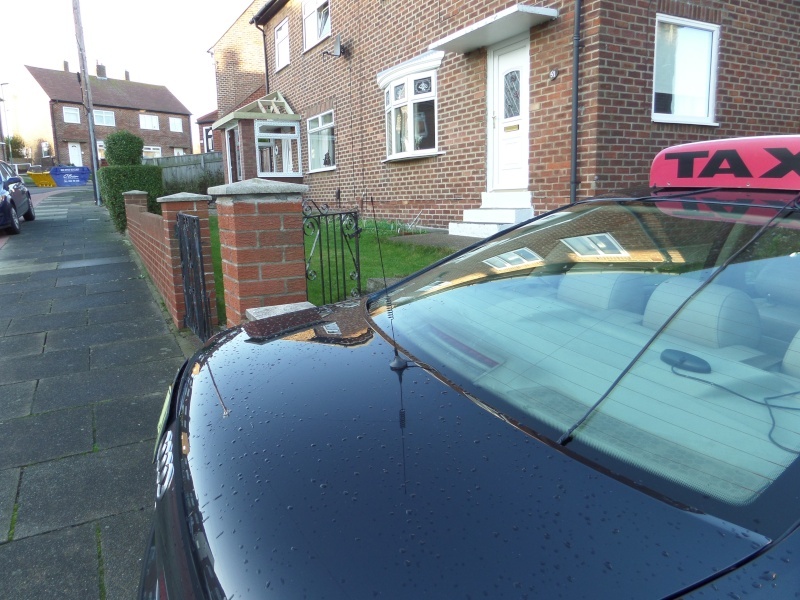 I looked at the window mounted antenna,mine is on the nearside (passenger side) and other way up from yours,however it did come with the radio etc.I suppose all in all if you don't want the frustration, go for the aerials you have suggested.It'll be one for me to bear in mind!